With the second issue due out very soon, I jumped at the opportunity to get my hands on a free copy. The only catch was if I liked it, to consider purchasing the second issue here. (I have!) I've been reading more short story/novella collections lately. I love the variety of writing styles, scope of settings and shades of tone and science fiction and fantasy provides a grand realm from which to build a story. Issue #1 is worth dipping in to. The collection is well put together and makes each story stand out as strong and unique even when combined in a single issue with many others. 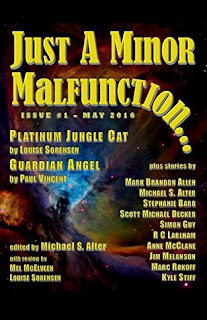 I prefer my science fiction leaning toward darker tales (like the dark of space, I suppose) and Just a Minor Malfunction satisfies my craving for science and tech that doesn't think like we do and twists of endings that feel like something irretrievable and floating just beyond my reach. My favourite tale in this issue is In the Cloud by Simon Guy. Years ago (err, decades) I learned about point of view in fiction and the POV we paid the least attention to was the second person. It was dismissed as cold, clunky and bossy and the teacher didn't have any more to say about it because, as she put it, we'd never run in to an writer silly enough to make a work like that public. With In the Cloud, that teacher has very elegantly been proven wrong. This short story is written as a young man to his mother as he explores his relationship with her and his grandfather in a way I can only describe as warm, intimate and appropriately blunt as we sometimes have to be to those we love. In the Cloud also feels chilling in the closeness of the relationships when juxtaposed against the severe distance caused by the technology of the cloud. My second favourite is A Man in the Moon by R.C. Larlham. It speaks eloquently about PTSD, isolation and the single minded struggle for relief for those who live with chronic pain. I definitely recommend taking Issue #1 for a spin. Did I mention you can get Issue #2 here?